Thank you so much for following along to the end of chapter two. Chapter three is well underway and will begin posting one page per week after a brief hiatus. If you would like to follow progress and get early access to the next chapter as well as many other artistic wonders, have a look at the benefits of supporting me on Patreon! Ahhh I’m so nervous for Jinn (and have been for several pages, despite frustration with her for inappropriate behavior). 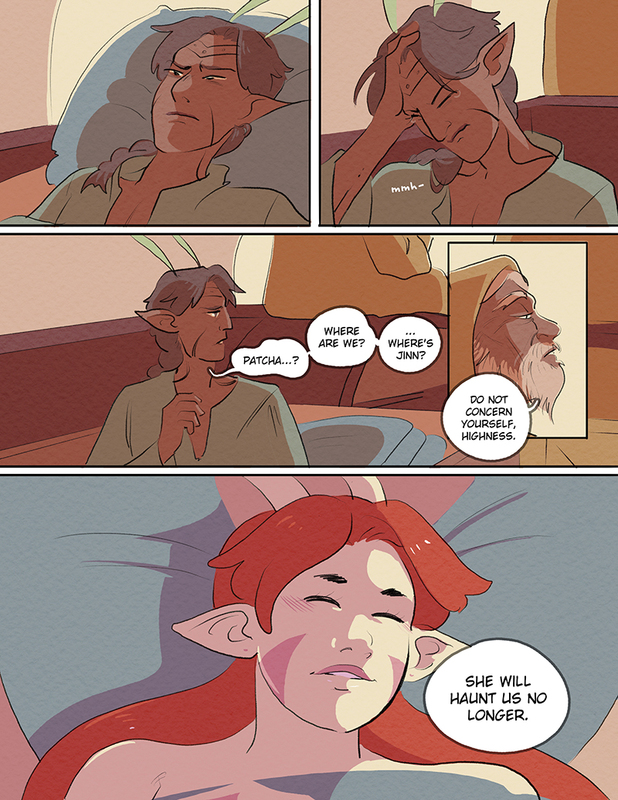 I have a feeling M’kait is not gonna be happy about this, despite the fact Jinn historically gets him into Situations… Patcha seems like a good example of someone who means well but doesn’t consider/respect the opinions of the person he’s attempting to help. *Gulp* Wonder how folks are gonna react to Jinn left there alone (plus of course her reaction). Great chapter! Looking forward to more.